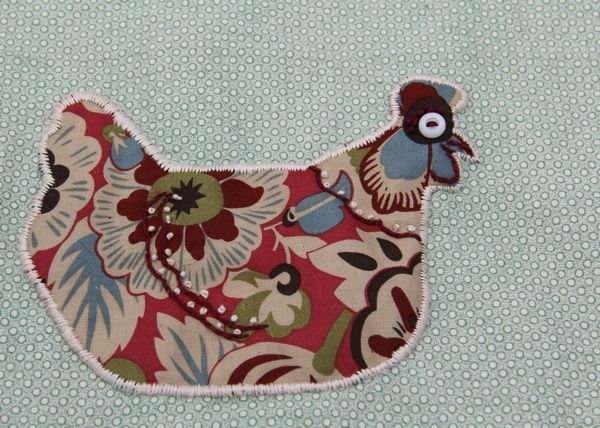 Flora, my embroidered, and appliqued chica, with a button eye. Flora and I are the only quiet ones today. Our real life, feathered chicas are clucking and laying, and dust-bathing. Our lady goats are making their regular, happy noises (Oops, and apparently escaping, too!) And all of the other bipeds are cleaning! Dishes are being washed, surfaces cleared, laundry shuffled, papers sorted, stuff dusted. It is a flurry. A wondrous, good flurry. And in the midst of all of this domestic domesticity, I am sick. Without the least hint of a symptom to warn me, I am suddenly knocked flat, with no voice, a painful-gross cough, chills, aches, fever. Swift & Sudden Sickness Delivery! They rang the doorbell, I answered, and blam! Sickness. Is it ever good timing? Not likely. I already protested, indignantly declaring this Inconceivable! But that made no difference. So, now I am at the resigned phase, trying to cover my bases, and anticipate any necessary adjustments. Coming soon... the pitiful, writhing and moaning phase! We happen to be hosting a zombie party tonight, for a certain televised season opener, but this is something the boys have well under control. They're decorating, cleaning, preparing, fortifying, and arming themselves for a scary good time. Maria and I will stick with the same plan we had all along: Hide upstairs! We'll have a stack of good story books, hot tea for me, and cookies and milk for her. And now, I am going to take my first cup of hot tea, my VapoRub, and Flora, and crawl back into bed, for my quiet Sunday. Oh dear, a sudden awful illness! Sounds like you are taking good care of yourself however, and I wish you a speedy recovery. Enjoy your cozy time hiding upstairs with Maria this evening! Oh sweet one! I'm sorry. Sending you love and wishes for a speedy recovery!! Hope you are feeling better today. Love the chica!! A quiet Sunday sounds exactly right for healing body and soul. I hope you feel much better very soon. Oh no! Sorry to hear you are not well. I love how your family just keeps on keeping on though - cleaning and prepping for a Zombie party. Get well soooon. Meanwhile, post from bed. 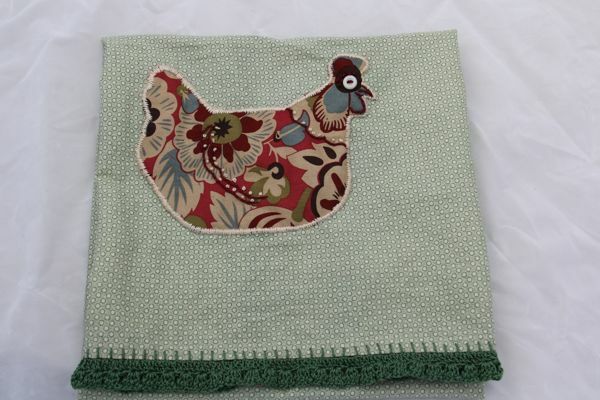 you may have gotten ill.
but darnit, you sure embroider a good hen. Zombie party sound fun! But so does hiding out upstairs, all cozy with good books and tea. Hope you are feeling better soon. Better to get the nasty colds out of the way BEFORE the strong of holidays, right?